The last post ended with my canoe trapped and broken on a granite outcrop at the base of the Fall Zone in Richmond, Virginia. I was on an 8-day journey by canoe from the Blue Ridge Foothills to Williamsburg; a middle-aged journey to mark the 30th anniversary of my arrival as a student at William & Mary. Two of my goodtime William & Mary buddies had joined in the adventure. We had 100 kilometers (~60 miles) left to go, were down to one boat, and singing the James River blues. I was reminded of a television commercial in which an aging cowboy gets his truck and horse trailer stuck in the mud on his way home to ‘keep the home fires going.’ In the commercial the narrator confidently declares, “this is the age of knowing how to make things happen”. With that attitude, somewhere in our ever-aging minds, we shook off those James River blues. Scott Harris’ canoe, long unused and safely stowed away in his parent’s barn, was 25-kilometers (~15 mi.) away. We’d lost a boat, but with a replacement boat at the ready – we would carry on. We were back on the James River well before sunrise, as the events of the previous day had put us behind schedule, there were many miles (or is that kilometers?) to go before we’d sleep. An early morning on the James, approaching the I-295 bridge east of Dutch Gap. The James was now a tidal river on the Atlantic Coastal Plain; twice a day the water flows in (upstream), and twice a day the water reverses course and flows out (downstream). The river was flat, but wide and prone to the vagaries of the wind. 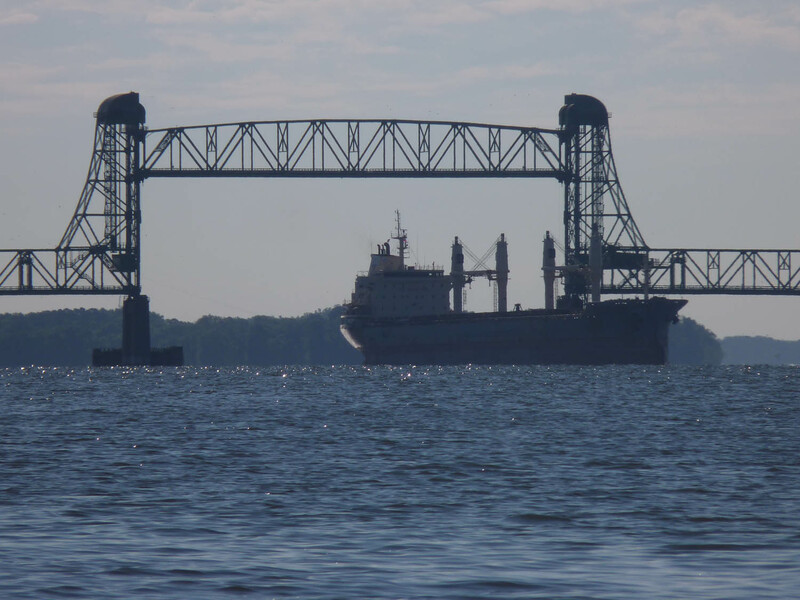 Large ocean-going vessels and long barges transit the lower James, throwing out a considerable wake. These were all challenges that we weren’t quite sure how we’d deal with. With the outgoing tide our progress was good. We managed 6 to 7 km/hr (>4 mi/hr) and glided through the James River cutoffs east of Dutch Gap. In the middle and late 19th century, for both military and industrial purposes, the James River was straightened through a series of cutoffs carved out of the unconsolidated Coastal Plain strata. 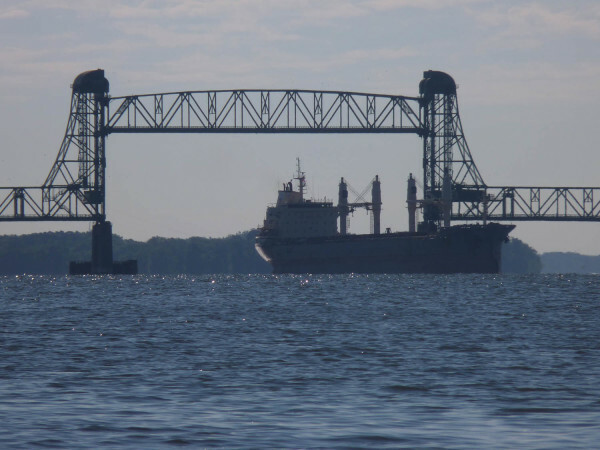 The Benjamin Harrison Bridge with an ocean-going vessels passing under the drawbridge. Low tide arrived as we approached the Benjamin Harrison Bridge — the easygoing was over. The mid-day hours were spent working against an incoming tide; the best we could manage was 5 km/hr (~3 mi/hr), and that wore us out. We stayed close to the James’s north bank, well away from the shipping channel, and were treated to fine views of the 18th century houses at Berkeley and Westover plantations. 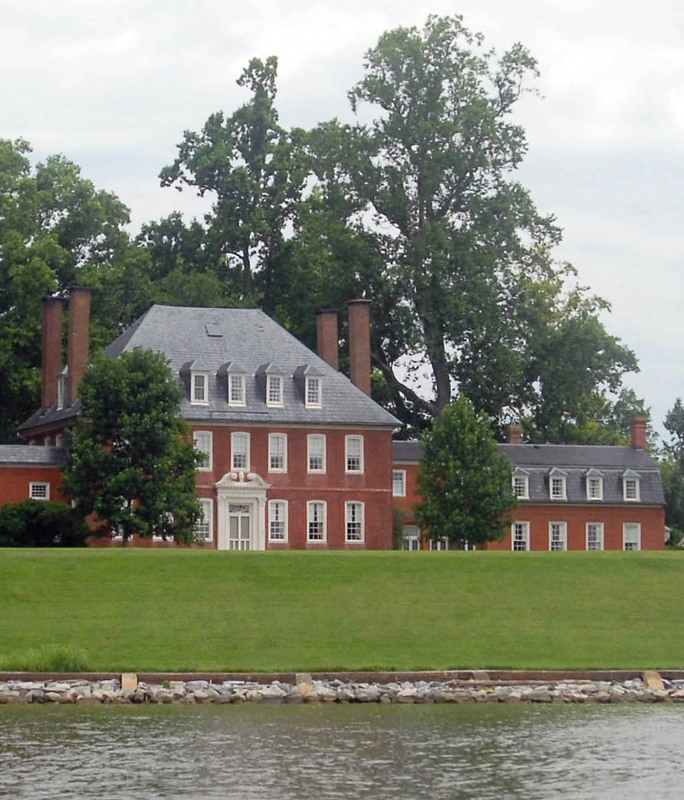 Westover Plantation from the James River. At Wilson’s Wharf, during the height of the mid-day heat, we settled in for some rest. The straight-line distance between Wilson’s Wharf and home in Williamsburg was just ~30 km (19 mi. ), but downstream the James makes three long big bends. The river distance to our take-out was actually ~55 km (34 mi.). We still had a long ways to go. GPS track of our velocity on the James River. Note – we went faster on the ongoing tide. All day we’d had a moderate and fair wind blowing from the west to northwest. In hopes of harnessing that wind we lashed the two canoes together and constructed a sail of sorts (basically, the ground cloth for a tent lashed to paddles). As we set off, the fishermen at Wilson’s Wharf shook their heads and smiled politely. Out on the James the wind was just not there, and we soon learned to paddle our double canoe/pontoon rig. We progressed slowly along the western edge of the Weyanoke Peninsula. It was here, in 1619 that their captors brought the first enslaved Africans to Virginia, planting the first seeds of a heinous institution that would soon take root in English America. Fittingly, it was here that the Union army laid out an enormous pontoon bridge to cross the James in June 1864 during the long and bloody last campaign of the Civil War. 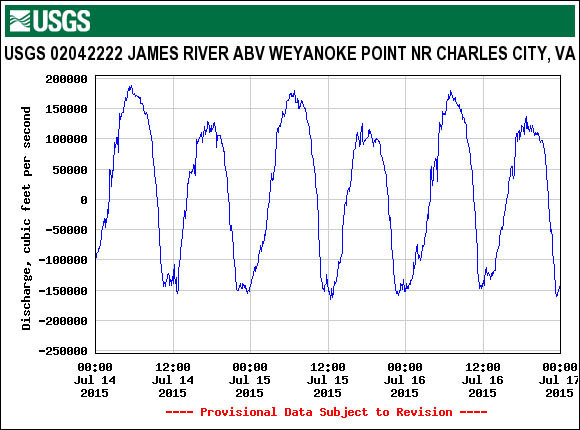 James River discharge above Weyanoke Point, Virginia. Note its a tidal river. Today the lower James near Weyanoke is quiet. A U.S. Geological Survey’s gauge records the tide coming in and out as well as the water chemistry of the estuary. The lower half of the peninsula is a gorgeous stretch of bald cypress swamp. Near Sturgeon Point, a northwest wind sprung up, and we became fair weather sailors in the early evening sunshine. We were on a downwind stretch, and the tide was running out. Our plan was to cover as much water as possible before dark. Sailing downwind on the James River. Between Tettington and Dancing Point twilight caught us. It was time to make camp, but there were no good camping options onshore, as the low beach would be flooded at the next high tide, and the swampy bottomlands were alive with insects. Three dudes in two boats. Twilight selfie in ‘camp’ on the James River near Dancing Point. Just west of Dancing Point we paddled 300 meters (1,000’) offshore, and tied the canoes to an abandoned fish trap. It was here that we’d spend our last night on the James. Three dudes camping in two lashed-together canoes make quite a sight. We stowed all the gear forward in one boat, and Scott (the tall guy) slept aft, while the two short guys shared the other boat. The night was clear with a big sky full of stars and the Milky Way’s distant arc – it’s something everybody should see. Dancing Point is the main stage for a colonial-era legend. Apparently nothing much grew on that narrow spit because the Devil had cursed that batch of ground. The legally titled owner of the land, Colonel Philip Lightfoot, was none too happy. The Devil and the Colonel argued over the land, but agreed to settle the dispute with a dancing contest. They met at the point, built a blazing fire, and danced through the night. By morning the Devil knew he was beaten and turned tail across the James River. To this day spectral sightings of flames and sparks are said to occur at Dancing Point. We didn’t see the devil, but, just before midnight, a military helicopter jarred us wide-awake. It circled in wide arcs, then hovered up-river for a half-hour before it finally turned tail and crossed the James. I’m not even sure that we were the object of interest, but lying prone in a canoe down range from a noisy helicopter makes one feel vulnerable. Truth be told, sleeping beneath the thwarts in a canoe is not comfortable, and little sleep was had. 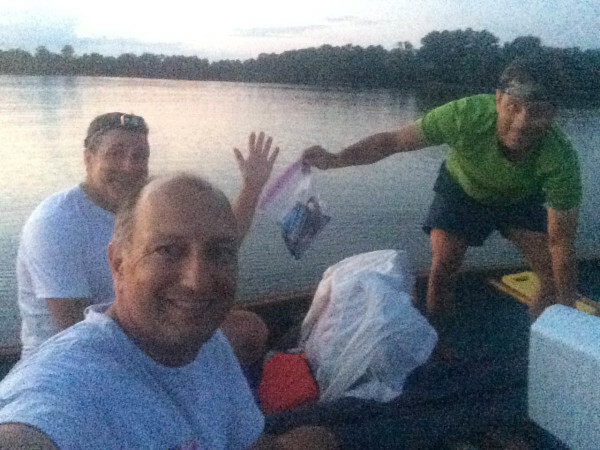 At 4:30 a.m., with all hands awake, we paddled to shore for a pre-dawn breakfast. We had 30-kilometers (19 mi.) left to College Creek Landing, and were keen to bring this trip to its conclusion. We kept the two canoes lashed together. Scott paddled and worked the ‘rudder’ in the stern; Todd and I labored in the front. 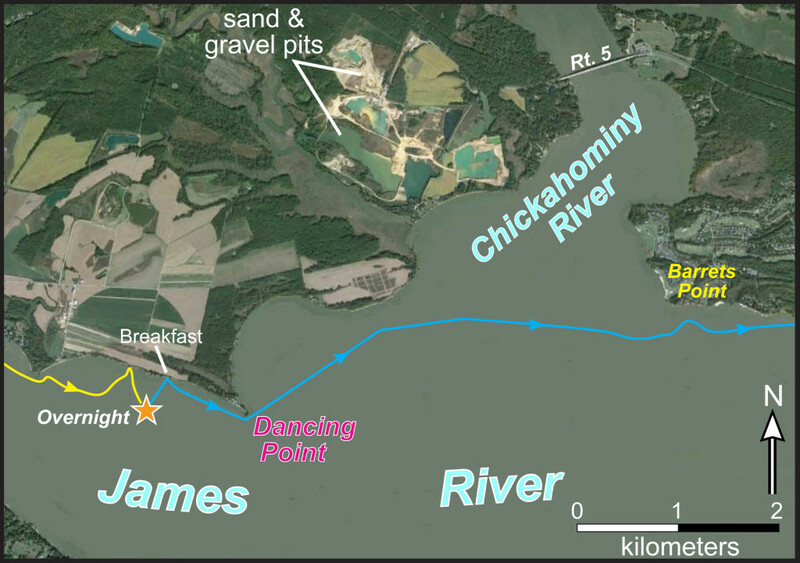 East of Dancing Point, the south-flowing Chickahominy River meets the James. It is a 4-km straight line crossing at the mouth of the Chickahominy, although the fair weather sailor can creep along the Chickahominy’s western bank to make a short 1-km crossing near the Rt. 5 bridge (but that adds distance). Scott Harris is no fair weather sailor – he laid us on direct heading for the Chickahominy’s far shore. Surface weather map for 7 a.m. July, 16th 2015. 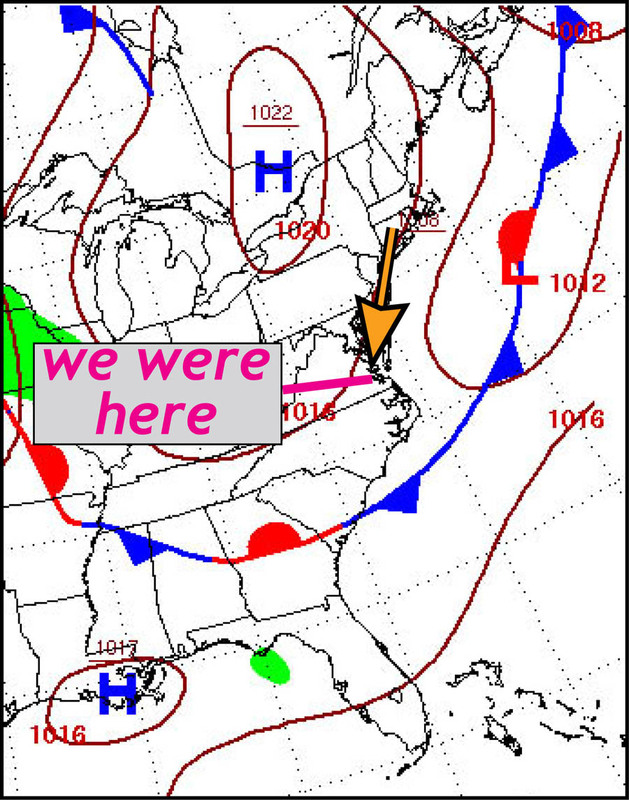 A high-pressure system in southern Canada brought a moderate northerly breeze down the Chickahominy River. Here the river flows from north-to-south, providing ample fetch to kick up waves when the north wind blows. 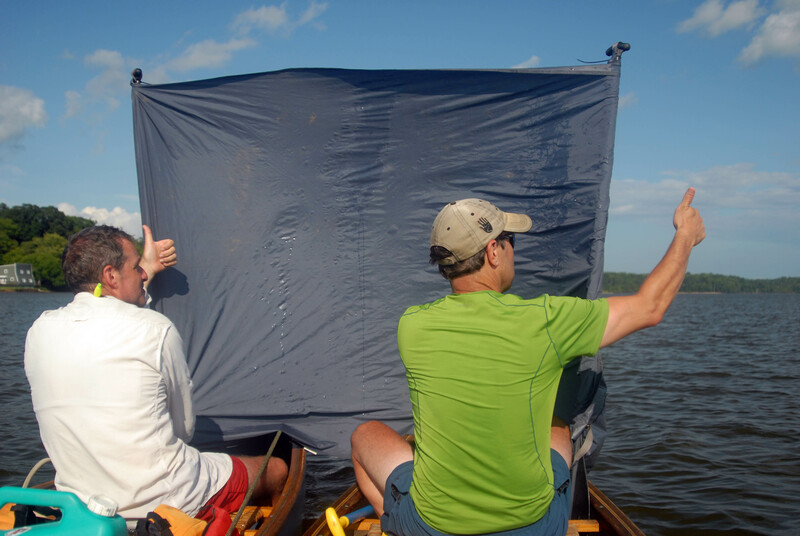 We experienced 20- to 30-cm (8 to 12”) high chop; not a big deal, but we did take some water over the gunnels between the rigged-together canoes. Onward we paddled towards the distant shore. Halfway through the crossing, some 500-meters to our south, and well out in the James, we saw a bobbing yellow canoe with a single occupant drifting to windward – an early morning mystery. Perhaps it was the Devil drifting across the James after a long night at Dancing Point? We pulled into the lee of Barrets Point by 6:30 a.m. happy to have the crossing behind us. After a brief respite we carried onward towards Jamestown. Seven more kilometers of paddling brought us under the piers at the ferry landing, and then past the replicas of the early 17th-century sailing ships Susan Constant, Godspeed, and Discovery. They were far bigger boats than ours, but they looked awfully small for crossing a mighty ocean. Then we paddled through the watery notch that separates Jamestown Island from the causeway connecting it to the mainland, we were out of the James (for the moment), but that pesky tide had turned. Our passage through the narrow confines of the Back River and then the Thorofare was slow, because we’d long since lost the tide. Beyond Black Point we returned to the James River, and crept slowly eastward just offshore. Our goal was College Creek, and our harried morning was intended to get us into College Creek before the tide started to fall. What was good while paddling down the James (a falling tide) was bad working upstream on a tributary. As we turned into College Creek the roiling and in-flowing tide brought us swiftly out of the James, and we raced under the Colonial Parkway. The big river was behind us. At noon we paddled our last few strokes, bringing our two-pronged pontoon-rigged canoe ashore at College Creek Landing. We had arrived – safe and pretty damn tired after 8 days and 300-kilometers (~200 miles). It was all the adventure I’d hoped for. Arrival at College Creek Landing, Williamsburg (sorry about the mansplaying in the back of the canoes). 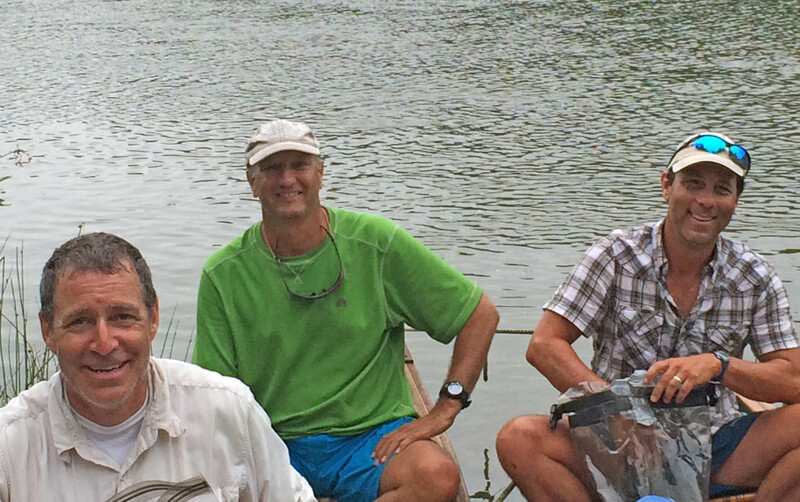 It’s possible to paddle a canoe from the Blue Ridge Foothills near Crozet to Williamsburg – the hydrologic network is connected! The James River system and its landscape range from sublime to striking. 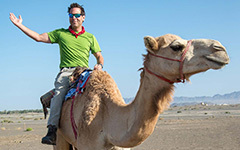 The geology and natural history are there to be discovered, and the basin’s long human history is compelling drama. It’s worth exploring. Nature is resilient. Our trip down the James River basin in the early 21st century was a far more scenic endeavor than it would have been in either the mid-19th or mid-20th century. However, for all the environmental progress of the past 50 years work remains to be done. Thirty years ago, during my first semester at William & Mary, I became friends with Todd Beach and Scott Harris. We’ve experienced much together over the past three decades. 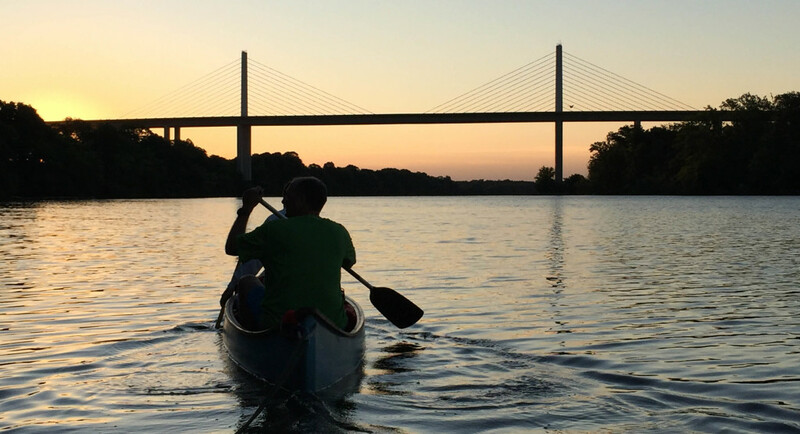 I’m glad they accepted my invitation to join this adventure and paddled with me across Virginia’s rivers. Treasure your friends.